For many men, wet shaving is more than just slapping on a handful of cream and then scraping off the stubble. It’s a daily ritual that is done with care and precision in order for them to look their best. And a large portion of these men has long ago determined that the disposable razors you get at the supermarket just aren’t up to the task. These men reach for a safety razor, and Muhle is often their brand of choice. It’s because Muhle Safety Razors are among the best for many years in a row. Muhle Shaving states on their website, “Our actions are driven by an affinity with nature and a desire for the very highest quality. Expert know-how and pioneering spirit flow into every product…” It’s this sort of company philosophy that has made them one of the world’s leading producers of high-quality wet shaving materials and one of the most influential in the wet shaving culture. The name, Muhle, is derived from the German word for “mill” and a mill has been the company logo from its humble beginnings. Muhle was founded in Stutzengrun, Saxony, Germany in 1945 by Otto Johannes Muller, who had some optimism left over after WWII. He had little funds, so he began working in a wash kitchen producing shaving brushes and lightbulb filaments. Rising from their humble beginnings, Muhle survived the challenges of post-war reconstruction and the political upheaval of the region during the following decades. They continued to produce some of the highest quality brushes, blades, and safety razors that could be found on the planet. Their dedication to the art of wet shaving is constantly revealed in their products. It appears that Muhle will be around for a long time to come. What is most likely obvious to most men who care about their shaving products. Choosing the right safety razor comes down to just a few key elements: beard type, shaving style, and plain old personal preference. Unlike many other companies, Muhle gives men options so that they can find a safety razor that is right for them. Here are some things to consider. Closed comb safety razors are designed for men that place an emphasis on a precision cut. If you wear a beard, goatee, mustaches, or want to trim around sideburns, a closed comb style head may be the right style for you. A closed comb is more suitable for beginners as well, because less of the blade is exposed, and therefore, it is considered less aggressive than an open comb. Open comb safety razors are recognized by the distinctive comb teeth that line the blade of the razor. Open combs are designed to guide hair, soaps, and creams too, and then away from the surface of the face. 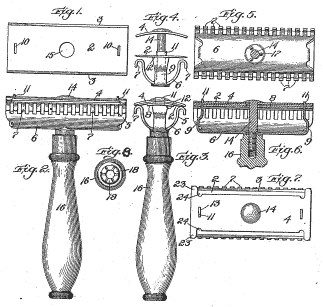 These comb teeth expose much more of the blade than a closed comb; therefore, it is considered a more aggressive style of razor. This style of safety razor is more suitable for men with thicker whiskers and those who often go days between shaves. You’ll also require a lighter touch because the aggressive blade is more prone to cause cuts and razor burn. One thing that can be said about Muhle that separates them from other manufacturers of wet-shaving materials is that they place as much emphasis on the look and feel of their handles as they do on the quality of their heads. They offer 26 different handle styles and materials that will fit just about anyone’s needs. The handles are either metal, wood, or resin, and have slightly different shapes depending on the material you choose. The “Grande” handles have a little more weight to them and should be considered if you require a little more heft in a safety razor. The material you choose will affect pricing, but if you find one that works for you, you can also purchase matching brushes. The Mule R41 is the style of safety razor for men who need an aggressive blade to eliminate a stubborn beard. The two-piece open-comb design doesn’t allow the blade to flex much, so it will handle anything that gets in its way. This, of course, makes the face more prone to cutting and razor burn. 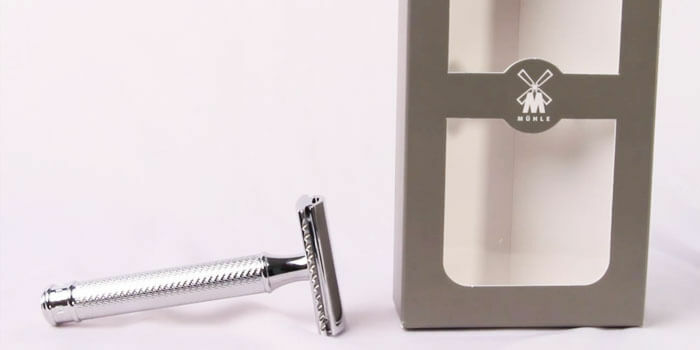 The R41 is recommended for the man who has experience shaving with a safety razor. You’ll get a close and comfortable shave every time. And with all the handle choices available, you can do so in style. The Mule R89 features a two-piece closed comb head with chrome plating. You’ll get a medium-aggressive shave that is close and comfortable. Great choice for beginners and experienced shavers alike. Choosing a textured handle will help with your grip if you need to shave at many angles to get the job done, or, like some men, you’re a little sloppy. Well balanced, and a small, compact closed comb head, the Muhle R106 is the perfect safety razor for the man who shaves quickly or sports facial hair of any sort. Slightly less aggressive than the R41, you can shave with confidence. Hardly a chance of nicking the skin unless you are a heavy-handed shaver. Three passes across your whiskers are all you should ever need to get a great shave from the R106. And, if you require a lot of detail, the closed comb and small head seem to stay out of your way as you make your lines crisp. If there is one thing that has yet to be said about Muhle Safety Razors and the company that manufactures them, it is the price. Sure, they may cost a little more than the average barber supplies on the market, but they aren’t your average safety razor. At the same time, they don’t cost near as much as the more “high-end” pieces you’ll find for sale online. Muhle’s mid-range pricing is actually a bargain when you consider their quality and reputation. This is one of the rare circumstances in which you actually get much more than you pay for. Another safety razors to consider are Merkur, Parker, Edwin Jagger.